The bilunabirotunda is the 91st Johnson solid (J91). Its surface consists of 8 equilateral triangles, 4 regular pentagons, and 2 squares. 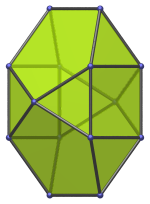 The bilunabirotunda is one of the special Johnson solids at the end of Norman Johnson's list that are not directly derived from the uniform polyhedra by cut-and-paste operations. Nevertheless, it is related to the icosidodecahedron: the “rotunda” part of its name refers to the configuration of two pentagons and two triangles around a vertex, which is actually part of the surface of the pentagonal rotunda (J6), which in turn is just half of an icosidodecahedron. The “luna” part of its name is defined by Norman Johnson as the triangle-square-triangle strip found on either side of the rotunda patches. There are two such patches of the pentagonal rotunda's surface and two such luna, hence the name, bi-luna-bi-rotunda. Parallel projection centered on an icosidodecahedral vertex. Parallel projection centered on a square face. The four pentagons project to the edges of the rhombus. Parallel projection centered on top and bottom edges. Parallel projection parallel to a pair of opposite pentagons. Parallel projection showing a 45° side-view. It may not be immediately obvious, but this projection has bilateral symmetry both vertically and horizontally. The pentagonorhombic trisnub trisoctachoron (D4.11).